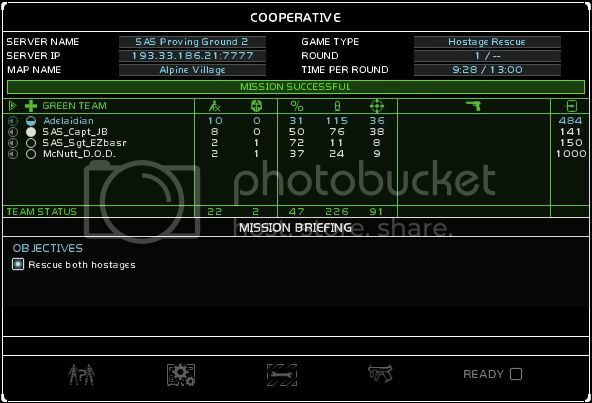 Today JB, EZ, McNutt and I have completed Alpine Village hostage rescue map with patrol mode turned on. We're not sure if it's the first time that's been completed, however it was great fun. This is the only evidence I have. HR with patrol can be very easy or very hard. It depends if the tangos near the hostages leave their spot or if they go all in the hostage room. It was Very hard because of some runners kept killin the hossies. Yeah it was hard, it took us over 40 rounds to complete it. @ Wiz, EZ and McNutt were valuable to our completion of the map. I was part of a team that completed it also, but it took over 60 attempts. As such, it's a rare thing indeed to complete it. Good job! So calculate the odds of success at roughly 2%. That's hard!! There were several runners that would go to a different hossie, we finally were able to flank them and beat them to the punch, yep it took a bit but we were tickled when we done it.